As the Kickstarter enters its last few days. 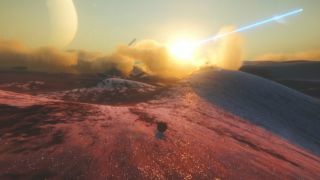 As I type this, "surreal exoplanetary exploration game" Exo One stands at the precipice, having raised over AU$30,000 of its AU$35,000 Kickstarter goal. It seems more than likely, then, that it will roll over that precipice and into an alien valley beneath, which is neat because that's pretty much the entire point of the game. As I mentioned a month ago, Exo One is seemingly a mixture of physics toy and walking sim, giving you control over a morphing silver ball on a series of beautiful sci-fi planets, while a narrator does some story over the top. —but now a video has emerged that better explains how Exo One will actually play. The trailer below offers five minutes of serene exploration, while narration man relays some story as the ball rolls and glides around, and developer Jay Weston chips in with a bit of developmental commentary as well. It's Dear Esther, essentially, only instead of walking very slowly around a Hebridean island, you're rolling around on sand dunes, building up enough momentum and energy to fling yourself into the sky, and above the clouds, where you'll probably use the Shift button to glide as far as you're able. At the end of the video, Weston comes across what looks like an alien monolith: a device that will transport the ship away from this starting zone and to another planet (Weston mentions gas giants and water worlds as future areas). Cruelly, inevitably, the video stops there, so we'll have to wait to see a glimpse of the other planets that lie in store. Exo One has an estimated release date of January 2018. You can read more about the game on the official site.